This humidity detector is very easy to use and it's very robust. The humidity detector FMW-B is an irreplaceable tool for both wood manufacturing and purchasing as well as for any professional sector where wood is considered a raw material. It is also capable of measuring a wide range of wood types (gross densities are stored in the detector). The humidity detector FMW-B for wood is guided by a microprocessor unit to quickly determine moisture content in wood and building materials. The humidity detector FMW measures moisture content when the lower frontal sensor is placed on the material for half a second. It is also possible to measure through paper or paints. After introducing the unit weight (gross density) of any wood type, absolute humidity can be precisely determined in all wood types. With the humidity detector FMW, moisture content can be measured in many different wood types from 250 to 1100 kg/m3 (see chart below). Put the humidity detector on the wood. Radiation penetrates wood up to 25 mm depth to measure absolute humidity. While measuring moisture content in wood, the result will be more accurate on smooth surfaces. Moreover, the measuring value will grow on chips or knots. On the contrary, if measurements are taken on breaks, the humidity value will be lower in relation to the real humidity value (absolute humidity). On rough surface wood types, the result displayed in the humidity detector can be lower than the real value. For building materials it is possible to introduce "0" value. For this detector there is only a single characteristic curve (mean characteristic curve). With the humidity detector FMW-B you will be able to easily determine humid zones in floors, walls, etc. 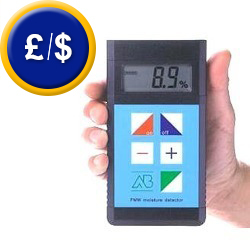 for a relative measurement in wet or weak areas.